--- Arthur Graeff, ed. Larry Neff. 202 pp. with index. An entertaining selection of English language newspaper columns by Arthur Graeff (1899-1969) concerning historical to mid-20th century folklife and lore. Some dialect material is included. --- Albert F. Buffington, 181 pp., Hardcover, with index. Music and text in the dialect (with full English translation) of 97 folk songs, many with variant versions. A major source for scholars and musicians. --- Russell W. Gilbert. 119 pp., Illus. A selection of 100 poems in the dialect by Gilbert (1905-1985), a major scholar and poet. Partial English translations and summaries are included. --- Charles H. Glatfelter. 544 pp., many illustrations, maps, tables and documents. A companion volume to Vol. 1. An important social history, well written and accessible. Both volumes are also of use to genealogists. --- Annette Kunselman Burgert. 405 pp., maps, photographs, ship indices, European place names and surnames. An important source book for genealogists. --- H. Winslow Fegley (1871-1944), ed. Alan G. Keyser and Frederick S. Weiser. Intro. Scott Swank. 312 pp. Elegantly designed book contains 301 black and white photographs of farm and small town life at the turn-of-the-century. The photos and captions provide a unique perspective of Pennsylvania German folklife. --- ed. Karl John Richard Arndt and Reiner C. Eck. Two volume set, 1245 pp., with indices of titles, printers, publishers, stereotypers, places of printing/publication and genres. Annotated bibliography of 3151 items. A major research resource. --- ed. Don Yoder. A two volume set: Vol. 1 (180 pp.) With black & white illustrations and index; Vol. 2 (269 pp.) in color. Vol. 1 is a critical introduction and English. Translation of a major fraktur work made by Denig (1755-1830), a Lancaster Co. shoemaker. Vol. 2 is a complete color facsimile of the original. A major contribution for those interested in religion, social history, music, and the visual arts. --- Raymond J. Brunner. 248 pp., 165 color and black and white photos and illustrations with index. A study of Pennsylvania German organ builders from the 18th through the early 20th centuries. Of wide interest for social history, aesthetics and religion. --- Annette Kunselman Burgert. 660 pp., with maps, photographs and index. A companion volume to Burgert’s two earlier studies. An important source book for genealogists. --- Donald M. Herr. 214 pp. with index, bibliography, appendices, photographs and illustrations. Herr offers up a treasure-trove of history about an early American art form that was long overlooked by scholars of Pennsylvania German culture. ---Aaron Spencer Fogleman. 257 pp. with index, bibliography, appendices and surname index. Fogleman traces the German migrant groups from their origins to their places of final settlement in the colonies. He contends that, to a significant degree, the immigrants and their children developed a new ethnic identity: adapting to the strains of migration, settlement and politicization, they became Americanized without becoming less German. ---Claire Messimer. 231 pp., color and black and white illustrations, maps, bibliography, index. The first book-length study of Pennsylvania German tombstones in almost fifty years, this generously illustrated volume focuses on the work of carver Joseph Brownmiller. The author examines Brownmiller’s art and life in the changing environment of Pennsylvania German culture in the early Victorian era. ---ed. Cory M. Amsler. 387 pp. with index, appendix, and color and black and white illustrations. Richly and profusely illustrated, this volume offers a stunning visual record of various fraktur forms, while also referencing the social and cultural milieu in which they were created. The book's essays, contributed by the leading authorities on this folk art form, touch on the spiritual, educational, aesthetic, and economic aspects of fraktur and consider the role played by itinerant artists, extended communities, and group migrations in transmitting the fraktur tradition. ---Margaret C. Reynolds, ed. and with a foreword by Simon J. Bronner. 192 pp. with index, bibliography, list of informants, and black and white illustrations. Despite the great interest in "plain" groups in recent years, comparatively little has been written about women and the particular role they play in preserving traditional religious and cultural values in the modern world. In this work, Reynolds portrays the women of the Old Order River Brethren and examines their roles in the ceremonies and traditions that allow the group to remain "separate" from other plain groups and from contemporary mass culture. ---Stephen M. Nolt. 208 pp, 14 illustrations/5maps. Historians of the early Republic are just beginning to tell the stories of the period's ethnic minorities. Nolt is the first to add the story of the Pennsylvania Germans to that larger mosaic, showing how they came to think of themselves at quintessential Americans and simultaneously constructed a durable sense of ethnicity. ---Jeff Bach. 282 pp. with index, notes, bibliographic essay, and black and white illustrations. Based on impeccable research and new insights into printed and manuscript resources and recent archaeological investigations, this volume reexamines and supersedes all previously published work on the eighteenth century religious community at Ephrata, Pennsylvania. It is the first of the many books published over the years on Conrad Beissel and those who joined him on the banks of the Cocalico that gives modern readers clarity on the religious thought and practice that provided the context for the mystical understandings of Ephrata's sacred world. Bach's work has already had an important impact on the way the Ephrata Cloister historic site is being interpreted; it is a groundbreaking piece of scholarship. ---Corinne and Russell Earnest. 153 pp. with index, bibliography, appendices, 30 black and white figures, 37 color plates, and index of scriveners. Renowned experts on fraktur, Corinne and Russell Earnest, turn their attention to the Pennsylvania German family register tradition and its place in American social, religious, and cultural traditions. 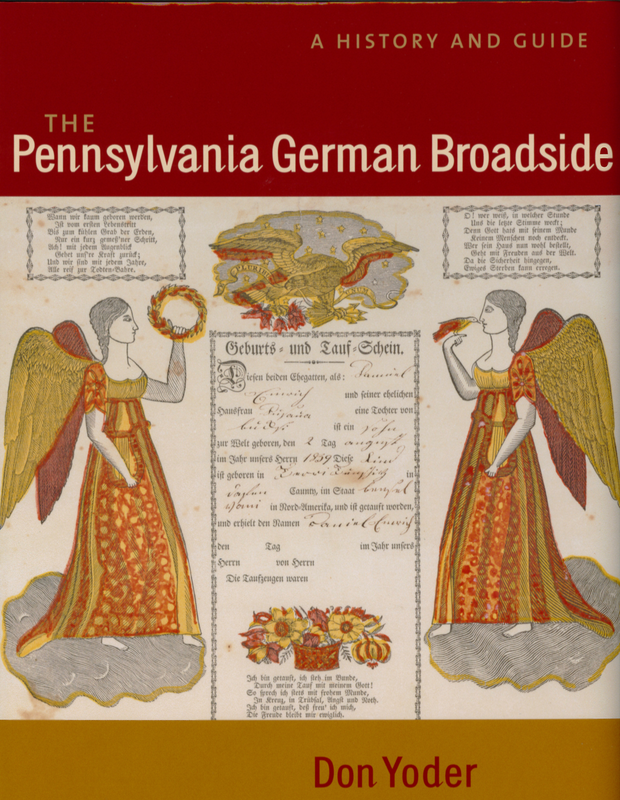 This is the first book to focus in detail on family registers as part of the fraktur tradition, and the Earnests offer numerous examples of the art to explain the importance of these documents in recording Pennsylvania German genealogy and in the transplanting of roots from Europe to America. The Earnests also bring the story of the registers into the present, demonstrating how certain Pennsylvania German groups, such as the Mennonites and Amish, continue the practice of family registers to the present day. Vol. XXXVIII (2004). Writing the Amish: The Worlds of John Hostetler; David Weaver-Zercher. ---368 pages; 34 illustrations. Writing the Amish both recounts and assesses Hostetler's Amish-related work. The first half of the book consists of four reflective essays—by Donald Kraybill, Simon Bronner, David Weaver-Zercher, and Hostetler himself—in which Hostetler is the primary subject. The second half reprints in chronological order fourteen key writings by Hostetler with commentaries and annotations by Weaver-Zercher. Vol. XXXVIIX (2005). PA German Broadsides. ---The author traces the migration of the broadside from Germany to America, dedicating each of ten chapters to a specific broadside subject, including medical broadsides, political and military broadsides, sale bills, posters, house blessings, and "letters from heaven." All German texts have been translated or paraphrased. This book is Intended for historians, folklorists, collectors, and general readers with more than 200 illustrations and interesting text. ---A study of the Wenger Mennonites, by Kraybill and Hurd--a sociologist and an anthropologist-- who use cultural analysis to interpret the Wengers in both Pennsylvania and Wisconsin. They compare the Wengers with other Mennonite groups as well as with the Amish, showing how relationships with these other groups have had a powerful impact on shaping the identity of the Wenger Mennonites in the Anabaptist world. As Kraybill and Hurd show, the Wengers have learned that it is impossible to maintain a truly static culture, and so their study examines the way in which the Wengers cautiously and adapt to the ever-changing world around them and is an invaluable case study of the gradual evolution of religious ritual in the face of modernity. Vol. XLI (2007). Powwowing among the Pennsylvania Dutch: A Traditional Medical Practice in the Modern Word. David W. Kreibel. ---David Kreibel examines the folk healing practice of powwowing, known in Pennsylvania Dutch as brauche or braucherei, which was thought to draw upon the power of God to heal all manner of physical and spiritual ills. Some people even to this modern day believe that this power to heal came not from God, but from the devil. ). In Powwowing Among the Pennsylvania Dutch, David Kriebel examines the practice of powwowing in a scholarly light and shows that, contrary to popular belief, the practice of powwowing is still active today. Because powwowing lacks extensive scholarly documentation, David Kriebel's research is both a groundbreaking inquiry and a necessity for the scholar of Pennsylvania German history and culture. Vol. XLII (2008). Architecture and Artifacts of the Pennsylvania Germans: Constructing Identity in Early America. Cynthia G. Falk. ---The author explores the relationship between ethnicity and the buildings, personal belongings, and other cultural artifacts of early Pennsylvania German immigrants and descendants. Such “material culture” has been the basis of stereotyping Pennsylvania Germans almost since their arrival. Falk warns us against the typical scholarly overemphasis on Pennsylvania Germans’ assimilation to an English way of life. Rather, she demonstrates that more than anything, socioeconomic status and religious affiliation influenced the character of the material culture of Pennsylvania Germans. Her work also shows how early Pennsylvania Germans defined their own identities. Vol. XLIII (2009). Heart Language; Elsie Singmaster & Her Pennsylvania German Writings. By Susan Colestock Hill. ---In the footsteps of writers like Harriet Beecher Stowe and Sarah Orne Jewett, the Pennsylvania German writings of Elsie Singmaster emerged to great popularity and acclaim during the early 20th century. Born and raised in the Pennsylvania German tradition, Elsie Singmaster wrote extensively over the first half of the twentieth century. Through her intimate knowledge of the community, Singmaster exposed the nation's expanding readership to Pennsylvania German beliefs, culture, and distinct dialect without denigrating the community or resorting to stereotypes. She believed that the Pennsylvania Germans embodied the best of the nation's ideals, and she crafted her characters and stories to participate in the national dialogue about immigration, development, and the definition of a hard-working, middle-class sensibility grounded in Old World traditions. While Singmaster's work fell out of site as the century wore on, her writings remain a significant contribution to the study of both Pennsylvania German history and culture and also the literature of the last century. This volume restores to print sixteen of Singmaster's short stories, reintroducing these important works into a new context of American development. Vol. 44 (2010). Die Pennsylvaanisch Deitsche / The Pennsylvania Germans. By Earl Haag. ---Die Pennsylvaanisch Deitsche / The Pennsylvania Germans makes broadly accessible representative selections of the picturesque prose and poetry of the finest authors in the Pennsylvania German dialect tradition. 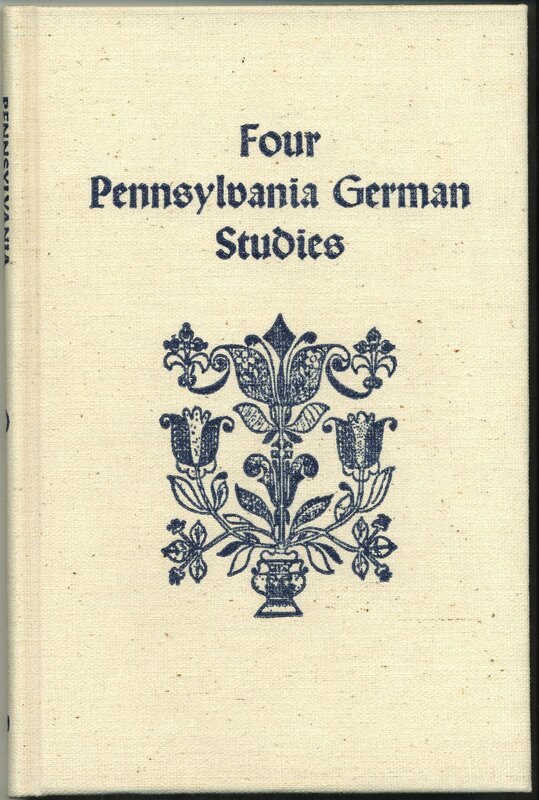 Edited by the foremost linguist and historian of the Pennsylvania German dialect today, this delightful classic will serve dialect speakers, students of Pennsylvania history, and especially students of the dialect itself. All articles appear with English translations. Instructive, entertaining, and historically enlightening, these Es Neinuhr Schtick (The Nine O'Clock Field Snack) articles originally appeared as weekly columns in the Schuylkill Haven (PA) Call and the Tremont (PA) Press and Herald. Who are the Pennsylvania Germans? The ninety-seven articles in part one, En Gleeni Gschicht, En Groosi Gschict (A little History, A Great Story), trace these Germanic emigrants from their Old World homelands to the soils they sought upon arrival in the New, their innovative methods of clearing the land for cultivation, construction of their farms and homes, and their progressive ways of working the soil and harvesting crops. In homelands, houses, and farming methods, they differed markedly from the "English", (anyone not Pennsylvania German), who already occupied much of eastern PA. In part two - Feierdaage, Feschtdaage, un Abbaddiche Daage (Holidays, Festive Days, and Special Days) - Haag has gathered poetry and prose to enlighten the reader about the distinctive traditions, customs, and lore associated with seasons, weather, and holidays celebrated by the Pennsylvania Germans, even into the present. Possibly no other ethnic group in America has so thoroughly documented and immortalized lives and times of its people in its literature. Vol. 45 (2011). Paint, Pattern, and People - Furniture of Southeast Pennsylvania; 1725 - 1850; !!! SOLD OUT !!! By Wendy Cooper & Lisa Minardi. Vol. 46 (2012). The Heart of the Taufschein - Fraktur & The Pivotal Role of Berks County, Pennsylvannia; !!! By Corinne & Russell Earnest. Vol. 47 (2013). Mountain Mary and Other Tales of the Pennsylvania Dutch!!! By Dr. Richard Wentz. *Click here to go to main Publications page.